A regular reader of my column wrote asking me what I put in my fried rice when I make it so I thought that I'd share that information with the rest of you also. There are various types of fried rice and that is indicative of what you put in it - eggs, chicken, pork etc. 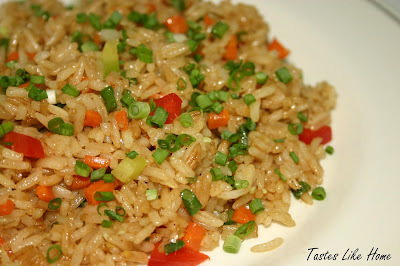 I usually make a vegetable fried rice and serve it with some baked or roasted meat or poultry. Please let me set the record straight that I am no expert at making fried rice. This is my interpretation of the dish. Once the rice is cooked, it needs to be cooled completely. Spread it out on a large baking sheet to cool. 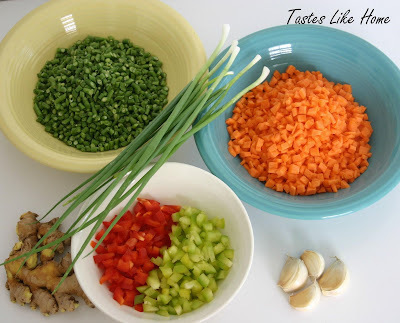 Cooking fried rice is a very fast activity so ensure that all the ingredients are minced, diced, chopped at the ready. In a karahi or wok, heat the oil until it's hot but not smoking. Add sweet peppers, rice, soy sauce to season and colour the rice, and a few dashes (shakes) of the five spice powder and mix the ingredients together. Taste the dish for seasoning, you may need to add some salt and more black pepper. Once the rice and vegetables are well mixed, the dish is done. Serve garnished with chopped green onions (scallions, eshallots) sprinkled on top.